This is one of the most entertaining things I’ve ever made in the kitchen. 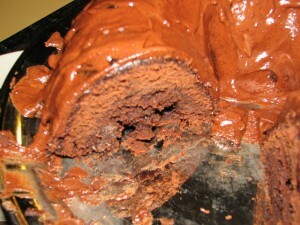 It’s a Bundt cake with this crazy fudgy tunnel going through the cake (that dark ring at the bottom). The recipe came from the 2009 Best of America’s Test Kitchen booklet, and it’s based on an old recipe from a Pillsbury baking competition. The confectioners’ sugar is apparently the key. Adam has told me a few times about a cake he used to make as a kid that had a fudgy layer that separated from the batter and dropped down to the bottom when it was baked. It was one of his favorite things to make and eat as a child, so when I saw this recipe I thought it was worth trying out. I’d hoped it would be like the cake Adam ate as a kid, and he said it was. I didn’t succeed in making the glaze in the recipe. The chocolate overheated and turned into a sludgy mess, so instead I melted my leftover chocolate frosting from the cupcakes and poured it over the cake. Just as awesome. Put an oven rack in the lower-middle position and preheat the oven to 350. 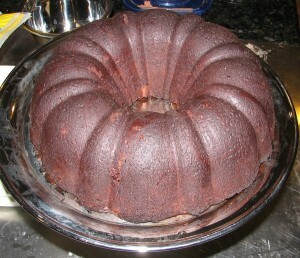 Grease a 12-cup Bundt pan (I have no idea how big my Bundt is, but it worked) and dust with cocoa powder. 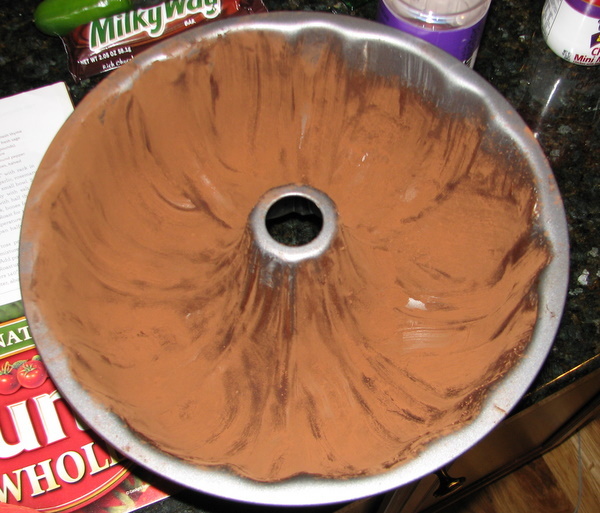 Pour the boiling water over the chocolate in a medium bowl and whisk until smooth. Cool to room temperature. 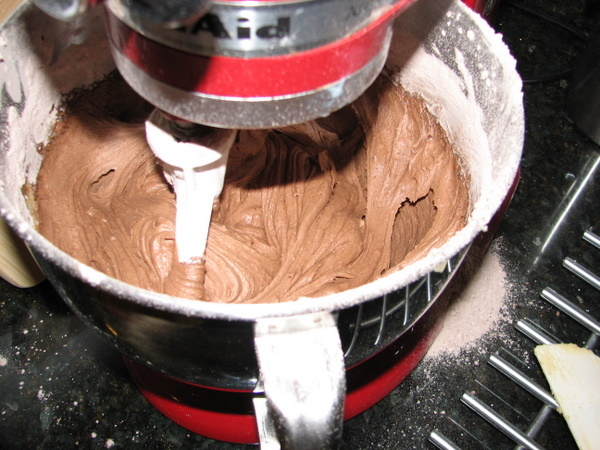 Whisk the cocoa, flour, nuts (if you’re using them), confectioners’ sugar, and salt in a large bowl. Beat the eggs and vanilla in a bowl or large measuring cup. 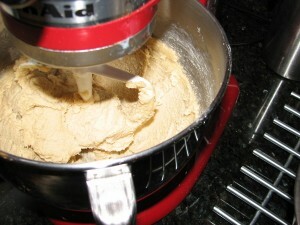 With an electric mixer on medium-high speed beat the granulated sugar, brown sugar, and butter until light and fluffym about 2 minutes. 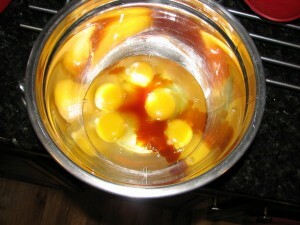 On low speed, add the egg mixture until combined, about 30 seconds. Add the chocolate mixture and beat until incorporated, 30 seconds. Beat in the flour mixture until just combined, about 30 seconds. 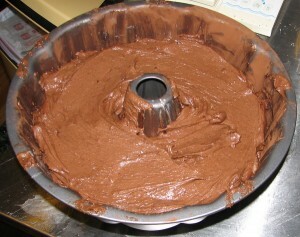 Scoop the batter into the prepared Bundt pan, smooth the batter. 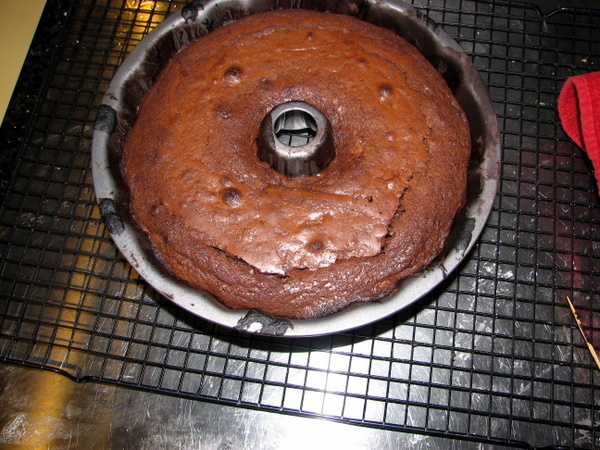 Bake about 45 minutes, until the edges are beginning to pull away from the pan. Cool upright in the pan on a wire rack for 1.5 hours. Invert onto a serving plate and cool completely, about 2 hours. 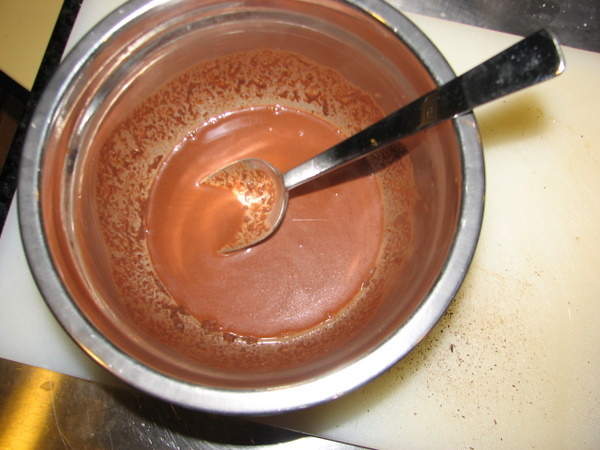 Cook the cream, corn syrup, and chocolate in a small saucepan over medium heat, stirring constantly, until smooth (this is where I failed). 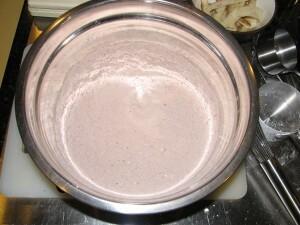 Stir in the vanilla and set aside until slightly thickened, about 30 minutes. 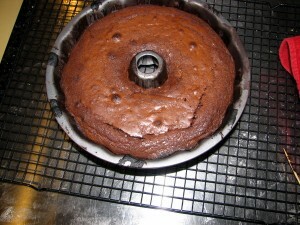 Drizzle the glaze over the cake and let set for at least 10 minutes. Serve.